Early yesterday morning, Elisabeth Elliot slipped away from this earth into the fulness of the presence of her Savior, the One she loved so dearly and so well. I didn’t find out until late last night and it greatly affected me. Such a mix of emotions. Somehow a world without her in it feels a little scarier–she was so passionate about holiness, about embracing the costly + sacrificial life Jesus calls us to, about obedience + mission, about giving up all else in eager pursuit of Him. She wasn’t afraid to say what was unpopular in her day, often drawing criticism for being anti-feminist or anti-women. She was committed to say and do whatever she found in Scripture, submitting entirely to God’s authority and upholding His Word, desiring more to obey and bring Him glory than to tickle the ears of her audience. 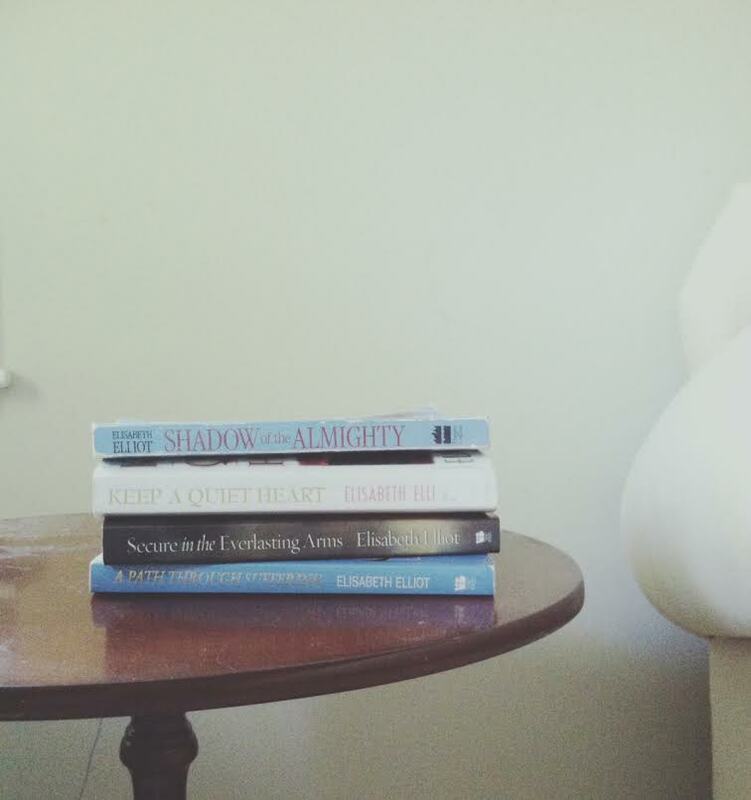 Having lost my own grandmother to the slow and dehumanizing effects of dementia/Alzheimers, I am familiar with what Elisabeth Elliot must have faced, and with what courage she faced it. I mourned when I read those words, realizing she was, in essence, already gone, unreachable now. All that I would have access to were her words. And, oh, what a treasure trove of words. I think of how In the Shadow of the Almighty convicted me in my college years, beckoning me to live a life of great purpose, devotion, ruthless trust in the face of suffering. Passion and Purity helped, convicted, and shaped my dating years and in many ways kept me from much heartache and wasted time. A Path through Suffering and Secure in the Everlasting Arms were two of the most prominent books that shaped me and comforted me in my early years of marriage; she introduced me to the Everlasting Arms that carried me when my dreams seemed shattered, my heart broken. A number of weeks ago I began working slowly (and savoringly) through Keep a Quiet Heart, to which I turned because of how divided, fretful, distracted, busy, and overwhelmed my soul has felt lately in this season of mothering three little ones ages 4 and under. In an age of internet, social media, constant connection, presence, and activity, I have felt the hushing whisper to keep a quiet heart. Throughout some of my most difficult and formative seasons, her role has been that of a trusted and steady guide–much like the rudder on a boat tossed on the wild + stormy seas. Quiet, unseen beneath the surface but firm, fixed, strong, steady, able to keep the weighty and unruly boat back onto its course. It, for some reason, deeply spurs me on. It reminds me–we only have so long here. We have been given talents, gifts to be faithful with. We have been given a certain allotment of time, a certain tenure on this earth in a particular generation. As Ann Voskamp said recently, “A pail with a pinhole loses as much as the pail pushed right over. A whole life can be lost in minutes wasted… in the small moments missed.” What am I doing with my time here? Am I numbering my days carefully, spending my life on what matters? Whose kingdom am I building? What/who determines my goals? She was one of those few that risked the most to invest the most. She was a woman who suffered many things, so many losses, and yet she went forward bravely. 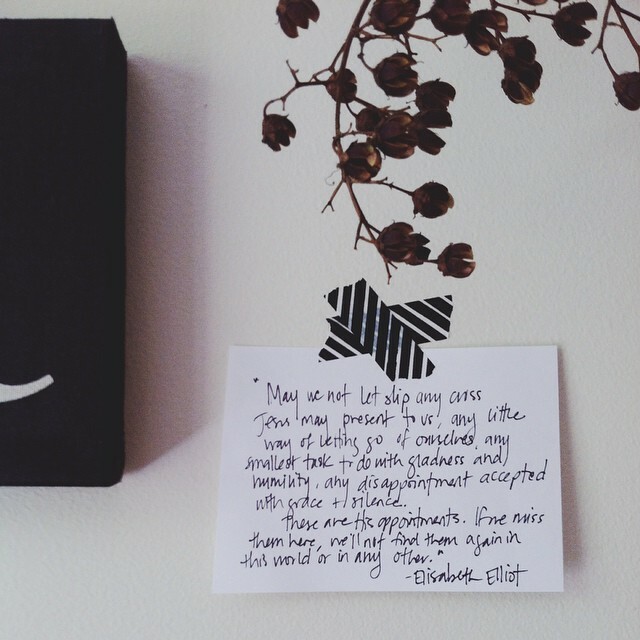 I read a comment written by a woman about her last night that has rolled over and over in my mind today: “It was always comforting to know a person like Elisabeth Elliot existed among the moaning and groaning, unsatisfied women of our world.” Yes, that was her. Kind in her ways, but having no time for the whining and complaining of Christ-followers, fretting over their discomforts. She struck me as having the salty preservative quality in her culture that Christians are called to have, being a voice and a presence that called straying, compromising feet back to the narrow path. She makes me want to be a better writer, a better mother, a better lover of Jesus. She makes me want to raise my daughters up to be like her: distinct, set-apart, meek yet strong, influential, uncompromising, loving much, loving widely, living obedient and pure lives. This woman invested her life and time to pass on the wisdom she has gleaned in her journeying with Jesus and she did so masterfully in the form of the written word. Truly, the family of Christ owes her a debt of gratitude, a debt of honor! How wonderful it is to know she is satisfied and complete, made whole and perfected now in the presence of her Savior, although her presence here will be sorely missed! Alzheimer’s, the Brain + the Soul by Tony Reinke via Desiring God Ministries. Words by Elliot’s husband, Lars Gren, on her website. I truly enjoyed all that you wrote! What a privilege to have met her in person! Yes, those words are so helpful. Somehow all of our activity, when done before God with a heart to serve Him in our serving others, is used by Him for His glory! I have this quote, pulled from her book “Keep a Quiet Heart” but written by Bishop Brooke Foss Westcott taped in my kitchen and have found it so true: “Great thoughts go best with common duties. Whatever therefore may be your office, regard it as a fragment in an immeasurable ministry of love.” Words written back in 1825 that are still true today! Thanks for reading, Robin! Martha, I too have been thinking on these things. You have put to paper so many of the thoughts that have been swirling in my head and stirring in my heart over the last couple of days. I’m so thankful for the written word and its ability to endure for us left behind those great great saints who go before. All Glory and Honor to Him!